When arguing with nutrition professionals about diet, it can be hard to get your point across. They often seem biased against ideas that don’t fit with their philosophy. They say we should eat a “balanced” diet (that includes sugar!!) and enjoy everything in moderation. When the topic of low-carb turns up, they tend to dismiss it, call it a “fad” diet and say that it is either harmful or impossible to stick to. 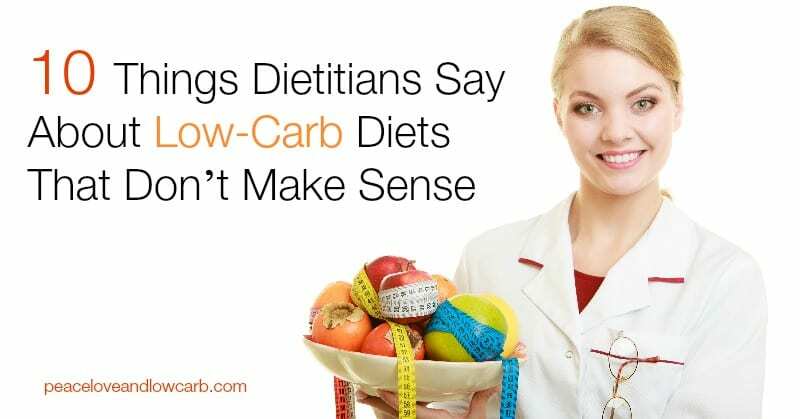 Here are 10 things dietitians say about low-carb diets that just don’t make sense. I often see the claim that excluding entire food groups can be hard and that it is impossible to sustain such an “extreme” change in the way you eat. Many people don’t seem to understand how low-carb diets work and what their main advantage is when it comes to weight loss. This is the fact that eating low-carb leads to automatic reduction in appetite andeffortless calorie restriction (1). Compare that to the low-fat, “balanced” diet – which requires you to count calories and be hungry! This is a graph from one of the studies that compared low-carb and low-fat diets. The low-carb dieters are eating until fullness, while the low-fat dieters are calorie restricted (2). I don’t know about you, but I hate being hungry. It is a very uncomfortable feeling. If I get hungry, I eat! If there is a diet plan out there that allows me to eat until fullness and still lose weight, then that sure is hell is the one I will choose. Humans didn’t have access to most of these foods throughout evolutionary history. We didn’t start eating grains until about 10.000 years ago and we certainly didn’t start eating processed junk foods until very recently. There simply is NO nutrient in starchy or sugary foods that we can’t get in greater amounts from animal foods or vegetables. And remember that low-carb diets are NOT no-carb. There’s room for plenty of vegetables, more than enough to satisfy your need for all the nutrients. Anyone with basic knowledge of biochemistry knows that this is completely false. They’re confusing the words “ketosis” and “ketoacidosis” – which are vastly different. When the body isn’t getting any carbs, it releases a lot of fats from the fat tissues, which go to the liver and are turned into so-called ketone bodies. Ketone bodies are molecules that can cross the blood-brain barrier and provide energy for the brain when it isn’t receiving enough glucose. This is the body’s natural response to a very low carb intake and also happens during starvation. Ketoacidosis is dangerous, that’s true. But that simply has NOTHING to do with low-carb diets. The metabolic state of ketosis has been proven to be therapeutic in many ways. It can help with epilepsy, brain cancer and type II diabetes, to name a few (3, 4, 5). On a low-carb diet, you’re encouraged to eat foods like meat and eggs, which happen to be rich in saturated fat and cholesterol. But the thing is, saturated fats and cholesterol aren’t bad for you. This is a myth that has never been proven. Despite being high in saturated fat, low-carb diets lead to a reduction in blood levels of saturated fat, because they become the body’s preferred fuel source (7). Saturated fats in the diet raise HDL (the good) cholesterol and change LDL from small, dense (very, very bad) to Large LDL – which is harmless (8, 9). For example, eggs have been demonized by nutrition professionals and the media. Despite the fear mongering, consuming eggs does NOT raise your bad LDL or your risk of heart disease (10, 11). But what we DO have are long-term studies on low-fat diets. In the Women’s Health Initiative, the largest randomized controlled trial ever on diet, low-fat diets were proven to be completely ineffective. Certain foods in the western diet actually lead to areduction in nutrient absorption. Additionally, avoiding wheat (including whole wheat) should lead to improvements in Vitamin D levels, because wheat fiber has been shown to reduce blood levels of this very important vitamin (20). Low-carb diets don’t contain wheat, are low in phytic acid and therefore don’t contain substances that “steal” nutrients from the body. Most natural, unprocessed foods that are high in fat like eggs, meat, fish and nuts areincredibly nutritious and especially rich in fat soluble vitamins, which low-fat diets lack. This is half true. There are certain neurons in the brain that can’t burn anything but glucose, but other parts of the brain can do just fine with ketone bodies. Even when we eat zero carbohydrates (which I don’t recommend btw), the body can produce ALL the glucose it needs out of proteins and fats via a process known as gluconeogenesis (21). Low-carb diets don’t starve the brain, they don’t make you feel slow (unless perhaps in the first few days while you’re adapting) and they give the brain a stable source of energy throughout the day. When your brain is burning ketones for fuel, you won’t experience the same blood sugar crashes and afternoon dips in energy. Personally my energy never feels as stable as when I’ve been eating little carbs for many days in a row. Bottom Line: The body can produce all the glucose it needs from proteins and fats if it isn’t getting any from the diet. It used to be “common knowledge” that a low-carb, high-fat diet would raise your risk of all sorts of diseases, most notably heart disease. Cause a greater reduction in blood pressure (23,24). Lower blood triglycerides much more (27, 28). Change the pattern of LDL (the “bad”) cholesterol from small, dense LDL (very bad) to Large LDL (29, 30). They’re taught in school to push the government-subsidized foods to help create demand for them (to keep farmers in business to receive MORE subsidies), and or national nutrition policy is geared with politics in mind and not health. Uncle Sam has no problem subsidizing BUSINESS, but individuals (via food stamps, welfare, Medicaid, etc. )…not so much. I’d like to ask Ag Secretary Vilsak (or whoever the current one is) exactly what disease or condition can grain by itself solve, that no other food in existence solves. Then I’d like to ask a doctor the same thing, followed by one of these dietiticians. In short, they (politicians) want us all to die off–there are too many of us, so they’re trying to limit our numbers any way they can: bad food recommendations, tainted food systems (GMOs, pesticides, hormones, etc. ), hidden/undeclared ingredients, allergenic ingredients, wrong nutrition label content (happens all the time in low-carb land), etc. Then there’s the bad/wrong medical care endemic to the healthcare system. There simply isn’t enough good, clean food to go around, and what exists costs too much. They want that food all to themselves, so the only way to kill off the competition is to literally KILL OFF THE COMPETITION slowly and surely (so as not to arouse suspicion) through the myriad of ways they’ve created and keep creating. A fat, sick, dumb, and dying electorate is EXACTLY what they want so they won’t get voted out of office! I am curious Kyndra. Since this diet relies mostly on meat, is it harmful eating meat that is not labeled organic or grass-fed. I wish I could by everyting organic and I get what I can, but it is so expensive. So am I going to poison myslef if I eat a large quantity of “regular” meat? Definitely not. While organic and grass-fed is ideal, eating regular meat is certainly not going to kill you. I always just tell people to do the very bet they can with the options they have and the budget they have, swapping things out little by little over time. We made a slow transition as finances allowed. So just my experience but I have been mostly high meat/fat for 20+ years after being overweight. I am in excellent health. I eat meat from a small chain grocery that is cut on site but not organic. Being older and having lived through many phases of nutrition, the body is very resilient – it’s not some fragile little vessel that has to have only the most pure. Think about it, man has survived millions of years eating all kinds of crazy stuff. I do low carb because it’s easy and I like the results.